Protects your RV from the most common electrical faults. Built in surge protection! Transfers to shore power or generator power automatically when energized. In the event that shore and generator powers are available, generator power dominates after a 30 second delay. 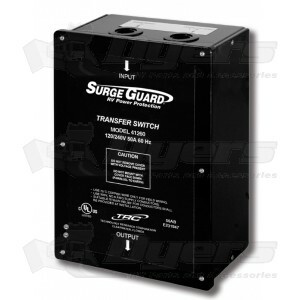 Includes surge suppression, and protects against common power supply faults. Provides the following protection: Open neutral, Reverse polarity. Provides basic surge protection of 2600 Joules at 76,400 Ampere. UL Approved ATS – full transfer switch rating, UL1008, (not general control). So far the transfer switch is performing well. One problem I discovered when I installed it was that it says to not install it on a ceiling upside down. I had no other choice without rewiring the whole coach. This should have been noted on the product description before I purchased it. That is why I only gave it 4 stars on quality. I replaced the ATS on a 2000 Bluebird. It fit perfectly, was fairly straight forward to install and now adds the surge protection which I didn't have on the old switch. Good product and Dryers had the best price and very fast delivery. Would definetly recommend both. It has removed all fears of pluging into any outlets at the campgrounds that we may visit. It has never failed me.